As photographers, it is important for us to establish a consistent and accurate editing environment, which means that ideally, we should be looking at an accurate representation of colors in photographs in order to properly post-process them. Because of this, our output devices such as monitors and printers should always be properly calibrated to reproduce accurate colors consistently. With Apple being a key player in the photography industry with its iMac, MacBook and Mac Pro hardware, specifically tailoring products for enthusiast and professional needs, there seems to be a great deal of misunderstanding and confusion about these products, their factory calibration / out-of-the-box accuracy and the proper process of calibrating them. Unfortunately, many photographers seem to think that they don’t need to worry about calibration at all with Apple products, which is certainly not the case. In this article, we will go over the process of calibrating Apple iMac and iMac Pro displays using an X-Rite i1Display Pro colorimeter along with DisplayCAL software, and demonstrate why properly calibrating such hardware is extremely important. In this article, I am not going to go into details of color management and calibration, as these topics have been explained in detail by someone who is far more knowledgeable than me. I would recommend to get started with the Basics of Monitor Calibration, where you will find plenty of valuable information on monitor calibration. As you can see, this simple test reveals that the iMac screen is far from being color-accurate out of the box. With brightness levels being too high for proper editing and automatic brightness adjustment turned on, I knew that the default settings just wouldn’t work. My blues were out of whack and the reds were also oversaturated, so this monitor definitely needed calibration. In fact, I can run the same test for most monitors out there and they will all reveal similar results, which shows that proper screen calibration with a good colorimeter and understanding of color calibration software is very important. Now let’s get one thing straight – as a photographer, you do not want to even try to self-calibrate a monitor without proper hardware and software. Your eyes and your brain’s perception of colors is pretty horrible, so trying to use software tools to calibrate a monitor will potentially make your monitor even worse than what you started with. So despite those built-in OS calibration tools and other third party software that seemingly help make your colors more accurate, you should avoid using those at all costs! In addition, while it might be tempting to try out different built-in display profiles within your operating system, those don’t help in achieving proper calibration either and they can also make things look much worse than the defaults. Lastly, don’t attempt to use a monitor profile from someone who calibrated their screen, even if both screens are identical. This doesn’t work due to things like differences in brightness levels, tolerances, age of display, etc. This is why each display has to be calibrated individually! So when it comes to being able to properly calibrate a screen, a proper hardware colorimeter is a must-have tool and unfortunately, there are no shortcuts here. It is also important to note that there is a distinction between what is commonly referred to as “hardware calibration”, where a wide-gamut monitor that has a built-in LUT (Look-Up Table) can be hardware-calibrated, and software calibration, where the video card changes color output to match the calibration profile. Since none of the Apple monitors come with LUT and cannot be hardware-calibrated, only software calibration method will work. And even for the latter, you will need to use a good quality colorimeter with the right kind of software to achieve desired results. Speaking of colorimeters, while there are a few manufactures that make hardware colorimeters on the market, the two biggest players that make consumer-grade colorimeters are without a doubt, X-Rite and Datacolor. X-Rite has two popular colorimeters, the ColorMunki and the i1Display Pro, while Datacolor has a single “Spyder” consumer-grade colorimeter that comes with different software options. For example, the latest Spyder5 can be bought in “Express”, “Pro” and “Elite” packages, which have the same underlying hardware. ColorMunki and i1Display Pro also differ primarily in software, but the former has a slightly different product appearance. Personally, I have used colorimeters from both companies. My experience with Datacolor colorimeters wasn’t particularly great, especially when calibrating multiple screens and assessing darker colors. Unfortunately, no matter what I tried, I could never achieve consistent calibration on a dual monitor setup. Even verifying existing calibrations was a frustrating and inconsistent experience. After trying and trying, I finally bought an X-Rite i1Display Pro and never looked back! I had no idea that there could be so much difference in colorimeter hardware – I was finally able to make a dual monitor setup work where things looked identical on both. In addition, I saw a drastic drop in performance overtime with my Spyder colorimeter – it was practically unusable in 2 years timeframe, while my i1Display Pro is still going strong and it is already 4 years old. Datacolor released newer hardware afterwards which supposedly took care of a lot of the issues I encountered, but I wasn’t going back either way. I know everyone’s experience is different, but if you ask the right people who are well-versed in calibration, they will all point to i1Display Pro being the industry standard. It makes sense – after-all, most high-end monitors from NEC and Eizo are calibrated with i1Display Pro hardware, and for good reasons, accuracy and consistency being the most important ones. 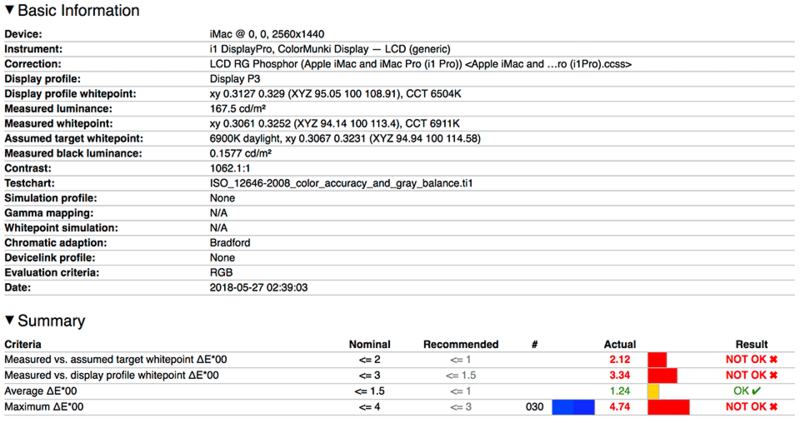 As you will see further down in this review, I used X-Rite’s i1Display Pro colorimeter to calibrate my iMac screen. For the above reasons, I will not be providing instructions for calibrating monitors using Datacolor Spyder hardware and software. X-Rite products are shipped with i1Profiler software, which can be used for calibrating your iMac or iMac Pro screen. While you can achieve pretty good results with this software and it is very easy to use, I personally prefer the combination of ArgyllCMS and DisplayCAL instead, which can be used to software-calibrate any monitor with a lot of different options. With ArgyllCMS + DisplayCAL you can do much lengthier calibration of the screen involving many more color patterns than what is found on X-Rite’s i1Profiler, so that you can end up with more accurate results. In addition, ArgyllCMS + DisplayCAL can be used to assess the quality of the iMac / iMac Pro screen and measure things like uniformity, where you are able to assess the brightness levels of different areas of the screen. In fact, if you have just purchased an iMac or an iMac Pro, I would highly recommend to use these tools to see if your sample of the iMac / iMac Pro is worth keeping. Apple’s quality control is generally very good, but it doesn’t mean that you should just skip testing the screen. If the display panel is defective, you will end up with a lot of problems overtime. For these reasons, I will be using ArgyllCMS + DisplayCAL to calibrate the iMac / iMac Pro screens instead of i1Profiler. 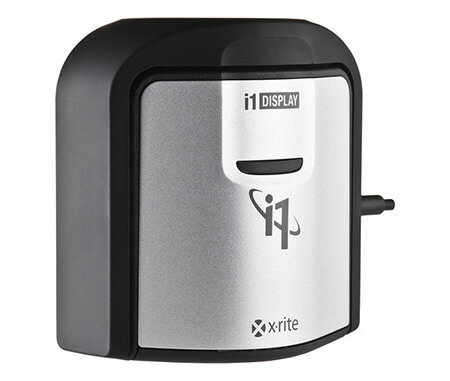 Go ahead and connect the X-Rite i1Display Pro to one of the USB ports on the back of the iMac – you do not want to use any external tools or USB hubs, since they might not provide sufficient power or have other issues that might impact the performance of the colorimeter. Once connected, you should be able to see it under the “Instrument” dropdown of the software, as shown above. 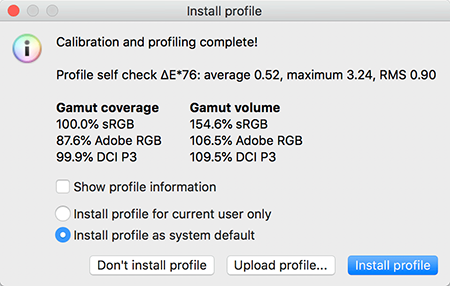 Here, we are setting the White Point to 6500K (D65), White level to 120 cd/m2 and Gamma to 2.2 – recommended settings for editing photographs. If you want better accuracy, set the Calibration speed to High or preferably Medium, as shown above. We will pick “Default testchart” as the test chart, which should be sufficient, as it will run 79 different colors for calibration. It is now time to calibrate – go ahead and click the “Calibrate & profile” button on the bottom of the screen to get started. It looks like I was able to get to 100% of both sRGB and DCI P3 coverage (0.2-0.3 percentage points is within the error margin), while hitting 87.6% of Adobe RGB, which is pretty good for an iMac screen. Go ahead and select “Install profile as system default”, then click “Install profile” to install the profile at system level (you will be prompted for a password). Update: Please note that there is currently a bug in iMac Pro that prevents brightness level to be retained when the machine is rebooted. Until Apple releases a firmware update or an update to MacOS High Sierra, you will need to use a workaround or a manual script to set display brightness level after each reboot. As you can see, the results are much better in comparison to the first test, with whitepoint deltas very low and maximum delta staying around 1, which is pretty good! As you scroll down the report, you will be able to see deltas broken down by color, along with a few nice graphs on the bottom. Just scroll through these and make sure that nothing stands out – you want all the bars to look green, which is an indication of good color calibration. As you can see, there is a small “Measure” button in each grid, which means that you will need to place the colorimeter within each rectangle, then click this button. What this will do, is flash white colors in each rectangle, then measure the brightness. At the end of the process, you will be presented with a similar HTML report, which will show how bright each area is. Look for any areas that show up in red, which could mean that those areas are darker than they should be. This should be a pretty good test to see if your screen has any uniformity problems. That’s all there is to it. Once again, big thanks to Color Consultant for guiding me with the settings – I couldn’t do it without him. If you have any questions about any of the above, please let me know in the comments section below! Is this compatible with Mac OS High Sierra? Dave, absolutely. I ran it on 10.13.4 yesterday, so it is fully compatible. I use a Windows cpu with two monitors and Datacolor’s Spyder 3 hardware and the Spyder3 Pro software ver 4.0.2. I can verify you findings that I can not get the two monitors in sync with each other no matter how hard I try. I have a few questions for you and hope you can assist. 1 I see there are two different units at B&H the X-Rite 1 display and the Rite Color Munki Display I am not understanding their difference besides price of these two items. 2 Do these units support Windows 10 the spec sheets indicate Windows 8 as the latest. 3 I belong to a camera club in New Jersey where calibrating with the projector seems to never result in satisfactory results. We use a Sony Laptop and Canon Projector. The room has lots of windows so light varies thru the year and weather. Would you recommend one or the other of the two units for that purpose. Or have you found any other magic that could be of assistance. Jordan, unfortunately, many of us end up in a similar boat because we made the wrong choices in the past. The funny thing is, both of my monitors are exactly the same model and they were bought at the same time and I still couldn’t get them to look the same. Only after moving up to X-Rite i1Display Pro did I realize that my colorimeter was junk! 1) Get the X-Rite i1Display Pro. That’s the colorimeter you want to invest in. It is compatible with pretty much every software and hardware out there and that’s the industry standard today. 2) Yes, absolutely. I have used the i1Display Pro to calibrate my PCs before getting a Mac and I still use the same colorimeter to calibrate my Dell monitors. The software works on all Windows versions, including Windows 10. 3) Calibrating projectors is a real pain and I wouldn’t recommend it, unless the projector you have is a high-end unit that costs thousands of dollars. You can set the i1Display Pro on a tripod, put it close to the projector and measure the colors, but there are a number of issues you have to consider. First, it means that the computer you use to connect to the projector must always be there consistently, since that’s where the calibration profile will be installed. You cannot use the same profile for the display, so you need to make sure that the profile only loads for the output signal. Second, the projector needs to warm up for a while until it outputs at the highest brightness levels. Third, you cannot have varying levels of light in the room – if you do, your calibration is not going to work. And lastly, even with all of these things kept in mind, you still might not be able to achieve optimal results, because projectors are simply not made to be color and contrast-accurate! The sensor for i1 Display Pro and the Color Munki produce the same color data, but the Color Munki is slower. The packages differ in that the Pro has better software. Since you recommend using DisplayCAL / ArgyllCMS the better software is of no value so all you are paying for is a faster sensor. I have used both the i1 Display Pro and the Color Munki with DisplayCAL / ArgyllCMS with identical results, but the Color Munki is slower. I recommend buying the Color Munki unless you value fast calibrations. I do not. DisplayCAL runs unattended after I get it going. Save yourself some money. DisplayCAL / ArgyllCMS is free but if you use it you should send a donation. Take some of the money you save on the sensor and send it to them. The software they are providing is excellent and they deserve financial support. Thanks Dave. I shoot in a developing country (thanks wife!) where people pay a pittance for pro photography compared to my home country, so ordering in something to replace my now aging (read obsolete) and fairly inconsistent Spyder means looking long and hard at $$ difference between the munki and the pro. Your help appreciated. No hardware calibration support for Munki Display on any manufacturer. If you plan to buy a NEC, Eizo… or even Benq or Dell widegamut an i1DisplayPro is a must… and a Munki Display is just a waste of money for that situations. At the same time ther are comsumer LUT3D at software level (madVR). Accurate LUT3D needs a huge number of patches. 1500 patches in 40 minutes with an i1DisplayPro is worth the extra money. Munki Display is just an accurate but slow solution for those who use typical sRGB IPS displays without hardware calibration, laptops or limited displays like an iMac (but just for those *who do not plan to buy a monitor with HW calibration*). The commercial printer I’ve been looking at recommends a white level of 60 cd/m2 to 120 cd/m2, so in their case, 90 cd/m2 might be a good compromise, and 120 cd/m2 might be a little high. I wish they were even more precise, but at least they have some recommendation, and some commercial printers don’t at all. The website buries this recommendation in an obscure page, but you can find it if you’re looking for it. Alternatively, I could use their optional automated brightness and contrast adjustment, but that’s even more likely to result in unpredictable and unacceptable results. If you’re not printing yourself, I think it’s this brightness issue that causes more fretting than anything else. I’ve seen more comments on the web about prints being too dark than being off color. Getting into color management for printing on a press gets messy quickly. The media used (newsprint to premium matte catalog stocks), and the LPI used, as well as the number of colors that will printed, all come into play in terms of dot gain, the main challenge one is fighting when dealing with print publishing. 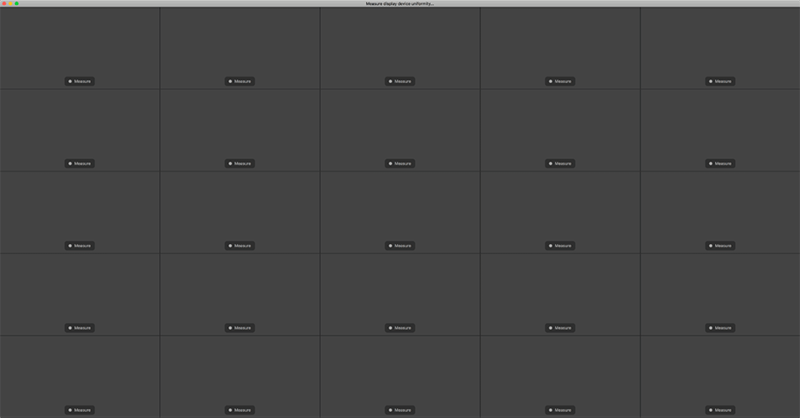 The challenge with screen luminance recommendations is two fold. The key element is the viewing environment. A screen at 60 or 90 in a properly darkened room without cross light/light contamination is not the same viewing conditions as a person working in an office with overhead light and perhaps even light from a window – that is three sources of light, all impacting your understanding of color on the display. For color management to really work, you want to have it from start to finish and be as consistent as possible. In an ideal world, your profile would be accurately profiled, you would be in a light controlled environment (color and luminance of the light is important), AND you would have a output profile (from the press that is based on the media and LPI of the project). This later one is nigh unto impossible to have, so you have to find as close as possible, then aim to work informed. Color correct for best case, then make notes on how the job did. There are so many variables that come into play, that any simple thing can throw a wrench into a given product. Ink brand or vendor change, media change. There are a host of brands of this stuff. What is chosen is usually a function of budget – a person knowing little to nothing about color management will choose a cheaper paper for business reasons and it impacts dot gain. Or, they can choose a cheaper ink, with more contaminants and that can lead to more color gain or darker in a given color (magenta tends to be most prone to this – purer/better inks are more expensive). In my experience using an industry standard for the reproduction type (web or sheetfed), the kind of paper, and the line screen (if possible) lead to the best RGB to CMYK conversions. This approach served me well the many years I was involved in publishing as a designer, producing everything from small black and white and color work for newsprint, as well as high end shorter run projects that were done on both web and sheetfed presses. The key, though, starts with a screen/viewing environment that will be accurate to the file. If you don’t know what you have, it’s hard to convert that color well for a given output. Generally I would do a basic conversion, then make some levels, curves, and or hue/saturation tweaks so that file would produce the ideal results for that particular project – and given what I was paid, I think customers were pretty satisfied with my process. Richard, 120 cd/m2 is recommended for post-processing images, but you are right – it might still be a bit too bright for printing. Personally, I wouldn’t be able to work with a 90 cd/m2 brightness, because it is too dim for my environment. I would have to turn off all the lights in the room, which would put a bit too much strain on my eyes. Printing is a whole different deal though, so I understand that my images might look too dim when printing, which is why I normally brighten them up specifically for printing. Mark has some good suggestions in his comment. Option 1) ISO P2 practical appraisal conditions (softproof). Monitor D50 and about 160cd/m2 or more, viewing booth D50 and more than 500lux, use softproof with simulate paper white in print profile. The good part of this approach is to work with several people at several locations and still get a good match across all workplaces. It’s expensive and narrow spectral peaks in D50 normalized fluorescent light may lead to other problems, I wish that industry moves to multiphosphor LED (also multi LED for uV content) solutions as soon as they can. Option 2) your printer’s lab practical appraisal conditions (softproof). Same as above but your printer may have choose a more relaxed viewing conditions to their customers since most of them will lack of a normalized light source (or near blackbody locus 5000K light source -Solux- or near daylight D50 Vrgb LED -Yuji-) or even a viewing booth. For example D50, 90cd/m2 for monitor… but it’s your printer’s choice, and you will need more or less the same print viewing conditions as your printer’s reference. IMHO they should stick to ISO P2 but this way they “mitigate” most of the customer’s complains about “they are too dark” since most of their customers won’t bother about light enviroment in their print view location. To get an actual match with “unknown” viewing conditions in customer’s home or office is not granted. IMHO ISO P2 conditions are a good starting point if you have a “good” viewing booth, even a custom/DIY one. Then you can tweak this starting point until it fit your needs. I worked for X-Rite… best company ever for employees. They took care of me during a health crisis and I will never forget them. That’s great to know Patty, thank you for sharing your personal story. I have no affiliation with X-Rite and it is great to know that we are recommending a company that treats its employees right. Good mornig sir, Iam using Nikon D810 with 24-120 lens, iam suffering to take groups in weddings,both sides of photos exposed not corectly.pls help me. Surya, please ask your question in an appropriate location (our forum, or perhaps an article that is related). I will not answer your question in an unrelated article. I bookmarked your – as usual – highly informative post, thank you very much for your efforts. I also turnt away from Spyder and got me a Color Munki 5 or 6 years ago. Which I was hoping to use for print calibration as well. But although it’s of great use for any monitor – on a Mac I could not switch off the color management for some Canon or Epson office (with “Photo” in the name) printers. Here I would need to purchase a real photo printer and then calibrate a small set of papers. I don’t think that will happen any time soon: Limited space for the printer but even more limited number of walls to put the prints on – and frequent printing is the only thing to avoid dry printer heads. I get the idea it would be nice to have some dedicated space for new pictures and store the old ones. Kind of “my picture of this week…” which also could be a motivation to put in more effort. Joachim, a lot of people don’t end up buying printers for the same reason, including myself. Ink cartridges dry up when not in use, which becomes a burden and too big of a cost to maintain overtime. I’ve come to think that the only reason to do calibration is if you’re wanting to be in charge of the end product for your purposes only. That is, it is only beneficial if you’re also calibrating your printer or using a third party’s calibrated printer. It is marginally beneficial for your own purposes on your own display. Outside of that, I don’t think it really helps anything any longer. Why do I say that? First, let’s face two facts: the vast majority of devices either can’t be calibrated or won’t be by their users. Second, the display technology changes and that throws things off. An OLED based screen will represent things differently from a IPS LCD which will be different from a TFT. You can calibrate but that doesn’t mean it’ll represent the same look across all devices. I would tend to agree with what I am hearing in your overall sentiment. Color management (CM) for most is a waste of time and money. Unless you are taking good full range images, processing them with wisdom and outputting them yourself, or have a trusted stable source, it is too much of a crap shoot. That said, if a person is involved in design or publishing work, then I think there is tremendous value in understanding CM and especially implementing CM to the degree that you can. As a practical matter, most printers won’t have profiles for their presses for the simple reason that there is so much media diversity, it’s not practical. And, also, just as practically, not all pressman run their press to the same standards. So, the best one can do is develop the experience to learn to provide images that give the other party the best chance to give you the results you hope for. Whether that is from your own inkjet printer, a commercial print provider, or publishing on a web or sheetfed press. In my experience, few places have the people, nor time, to educate their customers on this stuff. It’s just too much hassle, so they don’t. Customers are looking for good service, not education. That’s reality. Even if the education is intended so that the customer has the best chance of getting what they want. This all starts with a monitor that can be accurate to the files and a stable and consistent viewing environment. I’ve worked with very few places that had that. In the end, while it can make a big difference, in the real world, the real benefits are experienced the more closed and controlled the whole system is. Monitors are more stable than they used to be, but if you have a window in the room, then the background light angle, luminance, and color will change throughout the day, and therefore the perception of the display will vary throughout the day, too – no matter how well it was calibrated (if possible, many aren’t) – then profiled. I totally agree with you and you understood what I was saying perfectly. There is benefit but it is only to the degree that everything else is controlled similarly. I think there is an assumption that all photographers need to do this or their pics will be bad. In the past, maybe, when monitors were terrible out of the box. While modern monitors may not be aligned perfectly out of the box and change over time, they do a far better job now than in the past. Well – I may have overstated my position. While I am no longer doing the design and publishing work I once did, I do find it valuable (personally) to have a display that is accurate as possible for evaluating my files. That is only possible with a display that is properly profiled (calibrated first, if possible, but in many instances not). This helps me know what I am submitting for prints and publication. I do neither regularly enough with sources to understand what is happening on the other side, so if it’s an important print, it may take a couple or three attempts to get it right, but that’s mostly an issue of few places providing output profiles that are accurate – AND – I am picky. I work hard to get great captures, so I’m picky about what I want to see in a print. A well profiled display and controlled viewing environment allows me to be confident about what I provide. That’s mainly why I calibrate my own stuff. It’s for my own satisfaction. But as an enthusiast I feel I could spare myself the time and expense as may images are largely enjoyed online. I’m offering a counter-point view that has been out there for a long time saying, effectively, that if you aren’t color managed you’re not doing it right — no matter what kind of photographer you are. Turtle Cat, Mark and others – that’s one bad assumption to make and that’s one of the reasons why most people end up not calibrating their screens! Some think it is only for professionals, which is very wrong. The main purpose of having a calibrated screen is not directly related to printing (although it can be) – it is primarily to be able to see more accurate colors. If you are looking at an image that was edited with a calibrated screen and your setup is not calibrated at all, you might have a different perception of an image – reds might appear too red, blues might appear more magenta and the blacks might look “dirty”, especially with a high boost of contrast values on a screen. Here at PL, we are photographers. We are not just anyone with an uncalibrated setup. We look at each other’s works, which is more than sufficient to have a calibrated monitor. So it doesn’t matter what an average Joe out there uses. An average Joe shoots with a smartphone and he uses Instagram presets to make his photos better. That’s not us. We use a consistent, calibrated setup, because we know what we are doing. We edit images looking at more realistic colors today, because if we do end up selling our work or become pros one day, we don’t have to go back and redo anything. It doesn’t matter what technology we are using today – TFT / IPS, LCD / LED / OLED or anything else – calibration is necessary no matter what monitor we are using today. Sure things might look slightly different between different devices, but it is not because of you! Even cheap TN displays could benefit from the most basic calibration like the only one you can perform in a laptop or an iMac: grey neutrality and gamma. Of course there are displays that altough do not have D65 white, their gamma is more or less “sRGB” or 2.2 and their grey is neutral in color to its 255… so they are more or less usable “out of the box” because a “good enough” factory calibration *if they are just have sRGB-like gamut*. This is the way the have been used in consumer display market for a long time. For a widegamut display be it limited/crippled like P3 displays (like an iMac) or “true” photography widegamuts (9x% AdobeRGB, 9x% P3) an ICC/ICM profile (a display behaviour description) is a must. Some are generic profiles provided by manufacturer, but an accurate profile will be better by far.In OSX it is more important since its desktop is color managed and that carries some benefits and some drawbacks. Of course cheap monitors benefit. All monitors benefit. I basically said that. The problem is that the vast majority of monitors cannot/will not be calibrated. So what is the benefit of calibration to me, as a devil’s advocate, if someone is viewing my images online on their uncalibrated screen and I’m not selling prints or selling images to a corporation using it as part of a bigger project? That’s the thrust of my argument, not whether monitors could benefit from it. With respect, in my experience, the “professionals” are just as likely to have little to no understanding of color management as hobbyists, whether the context is design and print publishing, or photography. I get the benefits of CM. But it, like pixel management, requires understanding and clear education. The later is lacking. Most displays cannot be calibrated, relative to what that term meant in the early days, where the top displays did provide hardware controls for adjusting the display to match a known standard. All displays can be tweaked in software, but it’s not the same as hardware controls. However you get there, the critical element is the profiling – measuring what the device is actually putting out, relative to what was sent. All displays can be evaluated for this. The final piece is correct use of that display profile. Some software, when set up correctly used them correctly, some are more work. The second reality I have witnessed: You can invest in a top tier display, calibrate, then profile it, and use that profile correctly. Without controlling the environmental light, the perceived color is off, especially if it changes due to nearby windows. The rationales for not controlling the light come as quickly as not seeing a need to profile the display. That is the world I have seen, coast to coast, in the US. Again, in my experience, most photogs don’t use CM simply because there is little benefit to them (from their perspective). Their friends aren’t using CM on their computers, phones, or tablets, so you can have your images perfect on your system and they are not a match on those other systems. That’s real world. Does it mean I’m down on CM. Absolutely not, but I’ve been around long enough and been hired by enough people over the years, both by those making a living with design and photography, and hobbyists, and few see a need, or benefit, to the cost and investment of time. Is that idealistically as it should be – certainly not. But many “pros” shoot JPEG, too, not RAW. At the end of the day, each person uses tools in the way that SERVES THEIR INTERESTS – regardless of what is “best”. And, FWIW, I have used many different colorimeter and software combos over the years. A number of people have expressed negative experiences with the DataColor products. I have used at least three of their elite packages, including the current Spyder5Elite and not had any issues with them. I have used at least three different generations of X-Rite colorimeters and one of their top tier spectrometer at one point. They make good products, too, but sometimes the software is the weak point, in my experience. Your preferences and mileage may vary. Mark, I can understand that many professionals don’t understand CM to put it to good use. There is definitely lack of education, which is something we are trying to fill here at PL. However, it does not mean that if someone doesn’t do it right, everyone should follow. I don’t color profile my screens for someone else – I do it first and foremost for myself, so that I can see colors that are more accurate and work on my images. When looking at someone else’s work, I want to see what they saw when making their final image. Those two should be enough to motivate everyone to calibrate! Lastly, I will let ColorConsultant fill in when it comes to Datacolor vs X-Rite. I believe he has already written about it his previous article, if you want to look into it. I think we are on the same page on most of this stuff, though I am touchy about terminology. Most displays cannot be calibrated, so to use “calibrated” and “profiled” as equal, or synonymous is inaccurate. In the early days, and some of the current software instructions make the distinction that was made a couple decades back, with displays one would calibrate (the few monitors that allowed this), then characterize (or profile) the resulting output. I don’t think tweaking internal curves is the same as adjusting hardware controls, but I’m willing to acknowledge I don’t have the understanding of the more current displays and the controls they offer compared to the very few displays that could actually be calibrated. In truth, even then, over time, all displays deteriorate in their output, so that even if a display was beyond physical calibration, in essence making it like most displays at that point, it could still be plenty useable, benefiting from an accurate characterization (profile) of it’s capabilities. I have nothing to urge on one brand of hardware/software over the other – just expressing that I’ve used a bunch and while some are weaker on the software/updates, as long as the person using them understands what’s going on, useable results are possible from whatever solution. And I say that as a person who has been using two displays for nearly three decades, mostly in the Mac environment. I am so glad you said that. Some people either cannot understand or refuse to understand, that having correct colour either for your own use or as a ‘stable starting point’for display elsewhere, has overwhelming benefits. Being happy looking at incorrect colours is an odd stance to take, to say the least. Publishing these incorrect colours so that they look even more incorrect on the web or in print is unfathomable. A really well written and easily understandable article by the way. a) Datacolor devices are just a waste of money. They ARE NOT accurate at all. You’re buying an expensive paperweight. “Czornyj” user in LuLa posted a comparison between i1d3 and several Spyders (4 y 5) with a widegamut NEC and i1Pro (or i1Pro2, I do not remember) and a high end JETI specboss spectrophotometer. i1d3 with proper spectral correction were very acuurate, i1Pro was slighty less accurate (typical drift withing daylight locus to warmer whitepoint because 10nm and xy computations form CIE XYZ)…and Spyders were in the forest. The ONLY way to make these Spyder bricks to measure properly is a matrix correction, and you’ll need a spectrophotometer which is not cheap and THAT correction will be valid only for THAT spyder and THAT display because Spyders have very poor inter instrument agrrement (Czornyj & others). Even if you overcome those difficulties, i1DisplayPro will be faster and accurate in the very dark range. By design (dichroic filters + lens) i1d3 wins hands down, there is no battle. This is not good to consumers (one company rulling all)… but it is FAR worse for consumers to buy the looser device because consumers want their work to be done: one device can do it very accurate, the other cannot even compare results. b) “Elite” versions of Spyder the least intelligent buy anyone could make. It’s the same hardware, same speed… just software that it’s not even comparale to DisplayCAL features. Your paying more for nothing. c) i1Profiler is not as configurable as it should, you are right here… but who cares? i1d3 is a HID device, so OSX, Windows or Linux recognize it just by pluging it in… no drivers are needed. You do not need to put i1DisplayPro or Munki Display CD in your computer… nor download drivers. -Free software with public source code. -Upgradable by (reasonable) user’s request to its programmer. I certainly understand where you’re coming from. And you did note that I do calibrate my own equipment? However, I have to add that it really depends upon the end usage of the images. For example, I would make the argument that the majority of ILC camera usage ends up either unseen or seen only on the likes of Instagram, Flickr, or Facebook (as an example). So what objective advantage is there to color management when the consumers will have unmanaged devices? Will it be suddenly “closer to correct” or just “another difference in color”? Of course if someone is wanting to control everything and controls the output then color management is absolutely needed. But I would argue that for the majority of enthusiasts and certainly some number of professionals (granted they may not be that good as professionals) their only output is screen based. So would calibration afford them something? I’m mostly challenging the old accepted notions. It’s great to say all photographers should invest in a color managed environment but when more professional images are consumed on screen than print does it really matter as much unless you’re part of a bigger pipeline or controlling the output? I think we are piggy backing on each others comments. The main benefit, in my experience, in having a CM strategy that includes routinely profiling my display, is so I can see my images as accurately as my displays are capable. That said, I generally output web images to a smaller, but more common SRGB colorspace, simply because though it limits the gamut of my images, relative to what I would see on my own display, it yields an image that is more likely to be “more correctly” seen on displays outside of my control, whether it’s a computer, tablet, or cell phone screen. I agree with Nasim and CC that all displays CAN benefit from decent profiling, but for most, that is a theoretical benefit for the user. You and I have “correctly” seen the light, so we understand the benefits, but that is not the experience of most. And some businesses I worked with aimed to implement CM in their process, but it is one of those things that if all don’t buy in, then it falls apart pretty quickly. And, as others have repeated: ambient light has a direct impact on color perception. Thanks for sharing your experience Thorsten, looks like there are many of us who were not satisfied with Datacolor’s products! Nasim: would you use the same product on a 15″ MacBook Pro or would you use a different product? Thanks. 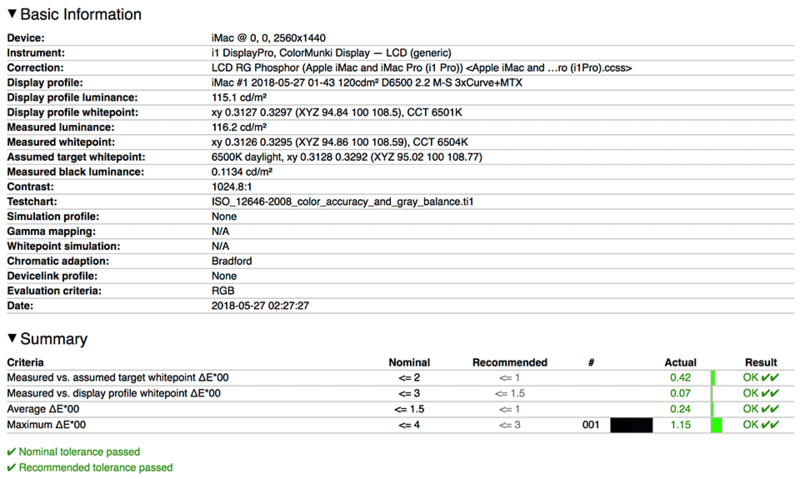 If you wish you could use Xrite’s i1Profiler… but DisplayCAL is better by far. If you don’t use Xrite software you don’t need to install drivers in OSX, Windows or Linux. Just open your colorimeter box, plug it to a free USB and let OS recognize it, then start DisplayCAL. Sandor, what ColorConsultant is basically saying, is that the latest generation MacBook Pros calibrate almost exactly like the iMacs, so the process will be more or less the same. Thanks for this really helpful article Nasim and ColorConsultant. I just wanted to double check something. I’m using a mid-2009 MacBook Pro and have just picked up an i1DisplayPro. At the start of the process with DisplayCAL you recommend downloading the color correction profile for iMac and iMac Pro. Would you also recommend that for my old MacBook Pro? I assume not, given the difference in hardware and age, but I just wanted to check that first. Currently the default for me is Auto (None). As a general rule, knowing technology type (LED/CCFL) + measuring RGB primaries coordinates (tools, “uncalibrated screen report” without colorimeter correction) could be use to make an educated guess (or at least reduce the number of candidates) about which specific backlight is used in a display. Thanks, Nasim! This is the first walk-through of color management that I’ve been able to actually follow and more importantly, understand why I was selecting the options in the process! I have had the X-rite iDisplay pro and X-rite software for a few years now, but I never seemed to obtain correct profile results two times in a row while using it. Now, I’ve downloaded DisplayCAL and followed the steps in your article, and violà! I’m very happy with the calibration results and now I can better manage my post-processing. Thanks, again! Thomas, glad you’ve found the howto useful – happy to hear that you now have a calibrated setup. Could you tell me what an ideal room setup should be in order to get the most out of using a calibrated monitor please? Should it have a window or room lights and if so, what kind are best so as not to contaminate the screen viewing experience? Bernard, you can have a calibrated setup in any environment. The most important thing to look out for is sunlight coming through the window and reaching the monitor – you do not want that. Other than that, it is possible to calibrate screens in dim or bright environments – you just want to edit images in as consistent of an environment as possible. For example, if you calibrate your monitor for daylight when it is bright in the room, you should always ideally edit images in similar conditions. If you end up turning off the lights at night and try to work with the same setup, it won’t work, because the screen will be too bright and will require recalibration. [Disclaimer: I’m not a professional.] Sometimes I edit after dark in a room with only a low wattage tungsten bulb in a lamp on my desk. The room is on the north corner of the house, doesn’t get any sun at all, and the daylight coming in the window is very modest. Invariably, when I check the image the next day during daylight, I decide that I need to increase overall brightness a bit, and less often there is a minor color issue. Then I recheck again in the evening, and usually decide that that daytime brightness adjustment was just fine, and now I have something that works more universally. There’s no scientific methodology to this, but I have noticed that, in general, in putting an image down and returning to it repeatedly to re-edit, in different ambient light situations or different mental moods, etc., I get the image to converge to what I feel is an ideal. Also, I learned the hard way that I’m less frequently initially fooled by brightness levels on the screen if I use a grey background to the images rather than a black one, even though I prefer black aesthetically. By the way, I bought an X-rite iDisplay pro based on many comments here in Photography Life, and have been very happy ever since. Nasim, can you update your windows calibration article from a couple of years ago. I still use my Dells with the internal LUT controls. What I don’t understand is how DisplayCal and ArgillCMS will come into play on a windows OS and the hardware LUT controls? 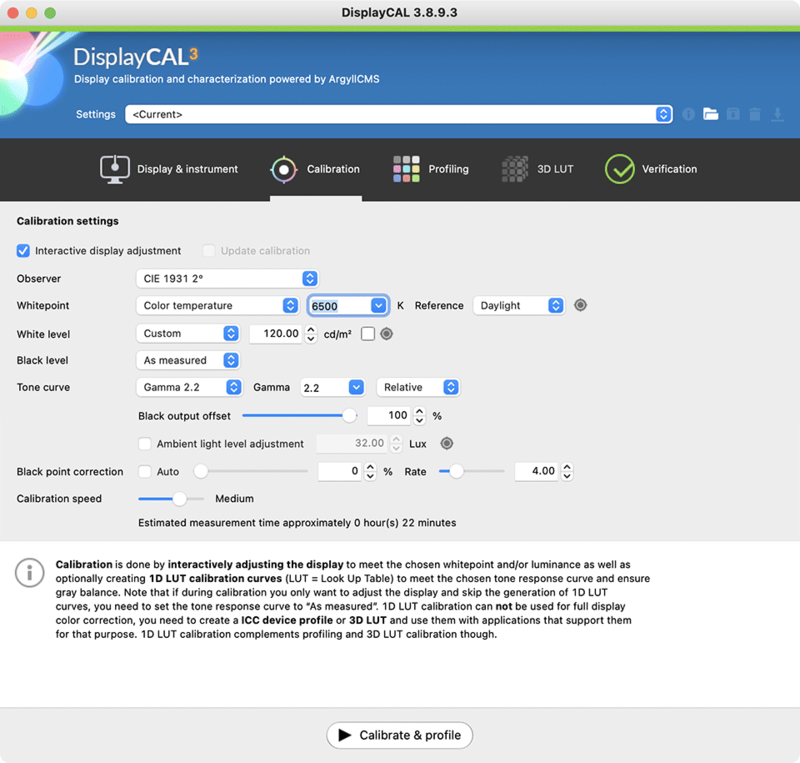 DisplayCAL cannot modify internal Dell LUTs… it just load calibration in a 1D-LUT at graphics card in the same way you do with an iMac (like in Nasim article). -an SDK for some hardware (NEC, EIzo, Dell, …) and good programming skills and very good knowledge of color management and calibration. Since the last one is not accesible for most of you, you are struck with manufacturer software. Is there a profile for Apple Thunderbolt display? or suggestions on calibration? I am using a MacBook Pro (Retina, 15-inch, Late 2013). -P3 like displays, use of of the corrections discussed in that comment. I have hit every download button on the DisplayCAL website and nothing downloads on my Apple. Am I missing something? On Argyll Color, there are too numerous to mention different things to download. Which one do you suggest? ArgyllCMS 64bit for OSX if you want to decompress it manually in a folder of your choose. If you choose to decompress ArgyllCMS in a custom folder, when DisplayCAL start it will ask for ArgylCMS’ “bin” folder, I mean it is asking for ArgylLCMS CMS folder and “bin” folder inside it. This has been informative. I use Spyder, but only on my iMac and my MacBook Pro. I don’t have dual monitors (yet), so this has been helpful. I do have to say that the colour shifts on my macs is minimal, which is one reason I purchased the macs in the first place. They have shifted some over the years, as they are both over 5 years old, but I have had many compliments on my colour, so I guess I’m getting pretty close. When I need to upgrade my calibration software and hardware, I will definitely take a look at teh x-rite environment. -It is true if you aim towards “near” D65 white with 2.2 gamma. Typical web publishing (sRGB) or video editing configuration. And this last one is the very reason to do not buy an Apple screen. They lack of configuration for custom whitepoint. Every correction should be done in graphics card (that’s DisplayCAL calibration, or the calibration you get from Datacolor/Xrite software) and that correction will be done limiting one or more channels, loosing unique grey levels and that could lead to calibration banding (an other issues) on some hardware (explained on other articles here in PL). I’m glad that you’re are happy with your Apple enviroment, but it is important to know its limitations to avoid surprises when you get that displays out of their zone of comfort (D65, 2.2 gamma), so you know which problems will arise and how to test how severe they are for you. I have an NEC PA272W that is connected to my 28″ iMac 25K. Thanks for the instructions to calibrate the iMac display. I use the i1 Display Pro. I continue to use my NEC/Spectraview calibration solution with the NEC display (it was originally used with a Mac Pro). Can I assume the NEC calibrations are independent and the NEC LUT does not interfere with the iMac display calibration using your method? Apologies for the double post! My original post did not appear until I sent the second one. I currently use an iMac 5k along with an NEC PA272W. I have been using NEC’s SpectraView II software with an i1Display Pro to calibrate the wide gamut NEC monitor ever since I had a Mac Pro. Today my NEC looks great attached to the iMac, however the 5K display is not well calibrated (tried using i1Display Pro’s software with some success). SpectraView does not work with Apple monitors so I’d like to know if using DisplayCAL only for the iMac 5K display will have any adverse effect on the PA272. I would rather keep using SpectraView with the NEC monitor and DisplayCAL with the iMac display. Any issues with this dual approach? Just make sure that each display have associated their profile: iMac screen get DisplayCAL’s and NEC get its own made with SV2. Adobe suite supports multimonitor with indpendent profiles. I’m not sure about GIMP. -DisplayCAL’s profiles carry the same VCGT tag. 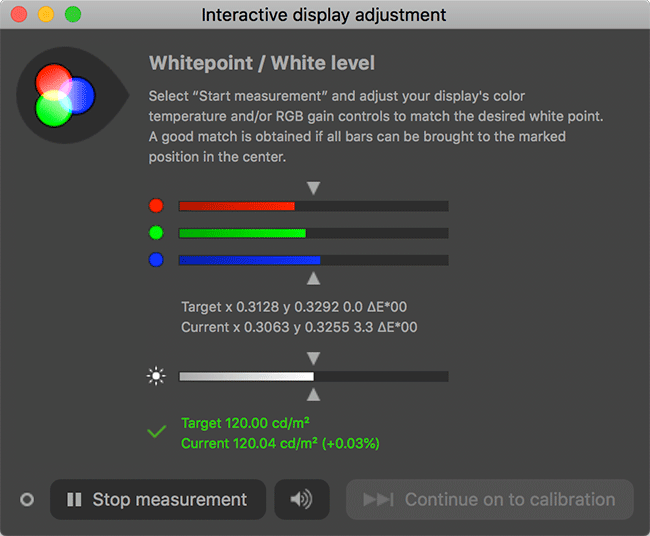 If you choose “calibrate and profile” DisplayCAL will measure and compute three 1D-LUT to make that display behave in whitepoint, gamma and grey neutrality as you want. Because of that these LUT content won’t be a “input=output”, they store an actual calibration. When OS or third party app (like DisplayCAL LUT loader for Windows) find profiles associated to a display, they will inspect profile content. If they find a VCGT tag (Video card gamma table) they will read it and load it into graphics card hardware. They will load “calibration” (white, grey and gamma only) to graphics card. Any modern (>2000s) graphics card should have one different LUT per display ouput. So iMac display calibration (VCGT) will be loaded into graphics card LUT feeding “internal display” and NEC VCGT calibration (which does not modify colors) will be loaded into graphics card LUT feeding Displayport or thunderbolt output where you plugged in your NEC. I hope that you understand now how it works. In the same way you can use this knowledge to detect problems. DisplayCAL folders contains some intentionally wrong calibrations with strong color cast to “force load” to each display and see if that display changes in order to test if LUT loading to graphics card is working. Read DisplayCAL documentation for further info. Given that Apple will be moving to only allowing 64 bit applications, I am wondering if 1Display Pro colorimeter software, or DisplayCAL / ArgyllCMS is currently 64 bit. I am having difficulties getting Argyll installed. I have downloaded it and can see it in Finder on my iMac. When I open DisplayCAL it says that Argyll needs to be installed. What is the correct process to install so that when I open DisplayCAL is able to see the installation? I apologize for this basic question but am stuck. I assume that you have ArgyllCMS unzipped in some folder of your Mac. DisplayCAL is asking for “bin” folder inside ArgyllCMS folder. ArgyllCMS executables are located there. Got it now! One last and probably obvious question. Once I go through this process, doing the i1Profiler process alone is not needed, am I correct? The process as you describe is a more thorough, complete calibration method? Yes? How often do you suggest you complete this process? 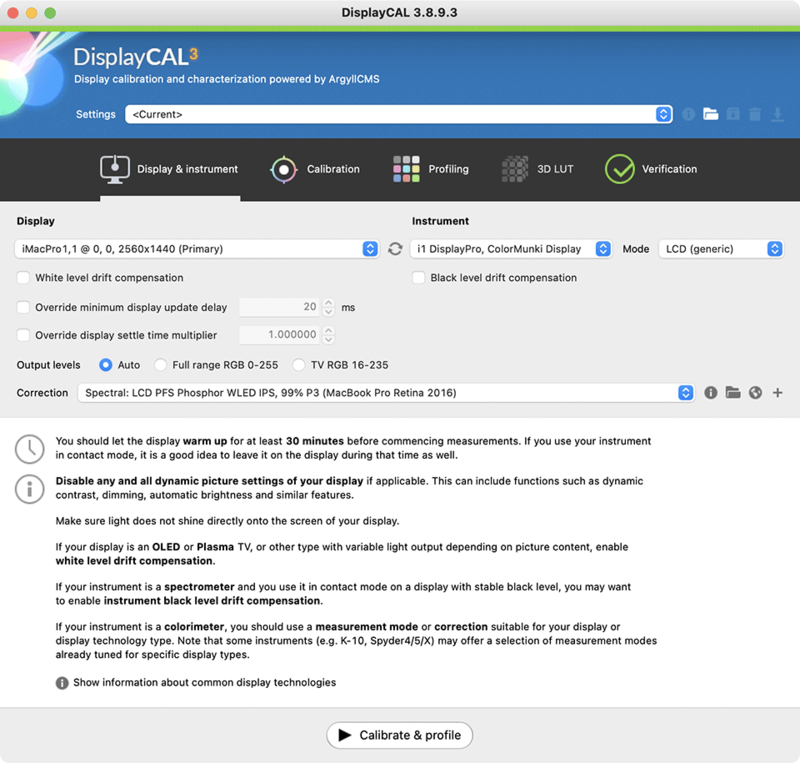 If you calibrate and profile with DisplayCAL you don’t need i1Profiler. Since you can validate your results… validate them from time to time, when they are not as good as they should be, recalibrate. LED monitors are stable, usually there is a small drift in whitepoint, try to validate in a month, if it is OK, validate next month. Aha! I thought something wasn’t right! I have an edited shot from March that a couple of days ago I thought I’d turn into an iPad wallpaper and when I put it on the iPad, the colors were wonky. Pardon me why I pull my Spyder5 Pro out of the closet! Although Spyders are not accurate, there are other sources of trouble in your situation. For example iPad screen calibration, the display you used for editing your shots or iPad’s “targeted color management”. I know that you may have done it, bust just as a general advice to those who read you comment and think that they are in similar situation: first of all you need a reference display with a color managed editor (+tested with DisplayCAL). Once you have this reference display you can appraise how good other “systems” behave but you have to give that other displays some “tolerance” about whitepoint. I say “system” intead of “display” because that system (or app running on that system) color management engine (or the lack of) may influence the way its display shows your image. For tablet/mobile devices you can use DisplayCAL’s remote measurement, to check how it performs. It’s similar to calman mobileforge but IMHO much more powerful for profilling BUT (a big handicap) it relies on internet browser app used in tablet. Color management (or the lack of) in tablet’s internet browser app will play a huge role here. I am running DisplayCal v3.6 which does not have a drop-down in the first screen on your tutorial for loading the correction file. I have looked through the menu options and can only find an option to load a colorimeter correction which I don’t think is what you are talking about. What has changed in v3.6 that this option has been removed? Colormunki Photo / i1Studio are spectrophotometers (without UV light source, beware using papers with strong OBA content). They do not use spectral corrections. They measure spectral power distributions. Unfortunately with 10nm optical resolution you may (will) miss 1st spike in red channel. That may give you a result for white point that can have some color cast. YMMV. If you are really serious about this buy an i1DisplayPro (or even a ColorMunki Display if you are not going to buy advanced monitors with HW calibration). Then use Colormunki Photo / i1Studio (3.3nm ArgyllCMS driver if you can use it) with DisplayCAL to build spectral corrections for i1DisplayPro/ColorMunkiDisplay *for each display* you want to measure. Then use i1DisplayPro/ColorMunkiDisplay for display calibration, profiling & validation using those corrections. That way your results will be more accurate. Sorry, my fault. I missed that you have an old iMac. I was talking about newer P3 gamut displays from Apple. I do not remember that iMac 2012 screen capabilities, if it is an sRGB LED 10nm would be enough (although blue max value may be a little wrong). If it is one of these old CCFL widegamuts like U2711 or PA271W spikes in spectral power distribution will look broader and less spiky that they are, so YMMV regarding color cast in white after calibration. I am using a Mac book pro recently purchased and for some reason i am getting an ‘unable to instal’ Notification when I try to install the calibrated profile. I am using i1 Display Pro and Display Cal software. Any ideas as to why this is? I am following your information and I came to the point where I can download the “Apple iMac and iMac Pro (i1 Pro) File Download. What can I do to open this please ? I have a calibration and profiling software question: Have you also tried BasICColor 5 Display software and if so how does it compare to your ArgyllCMS + DisplayCAL combination? Basiccolor will perform a GPU LUT calibration as i1Profiler or DisplayCAL, but it will take LESS grey ramp measurements so if your display (Apple, or whatever manufacturer you choose) has som kind of grey neutrality issues (pink or blue or green tints in gray scale gradient without calibration & color management)… then Basiccolor is not likely to be able to solve this. Hi, I have a late 2014 iMac 27 5K and I would like to know if I can use the file ccss that you have kindly provided…thanks! 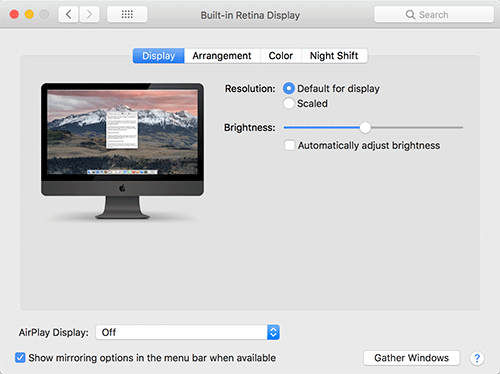 During the Calibration part, with the RBG bars and brightness, you tell how to adjust brightness to match the center indicator for brightness, but you fail to mention how to adjust the monitor on a IMAC to get the RGB bars to align. Also the manual says the 3 RGB bars have to align. You can’t change them… and the iMac is the culprit. It’s like a (big) laptop with the same limitations when you try to calibrate it. Whitepoint correction must be done loosing unique grey levels, lowering one or two chanels maximum output in graphics card LUT. This is one of the most obvious reasons to do not use Apple screens for serious work, specially if you want paper white whitepoint (glossyness is another one). Note: DisplayCAL does not support DDC/CI so even if Apple make public some kind of SDK to access “factory” LUT asociated with iMac display panel (not graphics card LUT, I mean display LUT like in a external HW calibratable screen) you won’t be able to use it with DisplayCAL. This article is the difference between me being able to do what I need to do, and being totally lost! Thank you, very much. I’m in the final editing stages of an online communication coaching training (series of videos) called “Fight to Better”. It’s for families and couples, and it teaches how to use conflicts as doorways to greater peace and understanding in family relationships. It will be ready in a couple months or so. (I’m well-versed in helping people talk to each other, and new to creating video content.) If you send me an email, I will send you a free access code as my way of saying thank you. Is there anything I should know, that is different from your advice above, in regard to calibrating my monitor for video editing in Final Cut Pro X 10? What do you do if when doing the uniformity check, you come up with areas in red? I have 3 in upper right and 2 in lower left. Is there any way to “improve” this measurement? Nothing. You cannot improve it. The only way to improve it is to use the “uniformity compensation” functionality present in some mid-high end monitors. In mid tier models (Dell, Benq, Asus, LG…) uniformity compensation may destroy contrast (<700:1), may lock RGB gain controls (render it almost useless for printing, like iMacs or laptops are useless for this task), maybe you cannot use it at the same tome as HW calibration.. or uniformity compensation maybe limited to brightness compensation keeping pink-green color tints as they were. In high end like NEC or Eizo these limitations do not happen with the possible exception of low contrast. So if you are actually worried about uniformity don't buy a Mac (or a dell or a Benq or a ….etc) and get a 27" QHD high end model for 1000 euro/us dollar. Thanks very much for response! I have a question regarding ambient lighting (through a window) or lights and the impact on calibrating. Should one have two different profiles, one for daylight and another using overhead lights? Unless you know what you are doing… do NOT use ambient light compensation since it does NOT work as most pople think it works (and this is even more troublesome in half baked color management enviroments like OSX). Thank you, yes I do use an iMac 27″ (2013), I will try to re-phrase my question. Example, I calibrated in the morning with daylight shining through office window. So now I have a calibrated monitor. As I said before, ambient light correction does not work as you may think. You can play with WP & white luminnace vlaues, but all the changes you do to (all the corrections applied to) target gamma will be undone with color managed apps… unless you lie to them. I mean unless you build a fake profile which stores what display should be/behave instead of what display behaves once calibrated with ambient light correction. Ambient light correction is more useful in non color managed enviroments like video, or in color managed enviroments (video) where you can modify with a LUT3D such things. Read DisplayCAL documentation if you need further explanation. Get a more stable ambient light enviroment rather than use ambient light compensation. PS. There is a new correction for multimedia P3 displays in i1Profiler. It’s a LED PFS phosphor backlight spectral sample suitable for those 9x% P3 gaming displays out there, iMac displays and all those new LED backlights close to them with high P3 coverage but very limited AdobeRGB coverage. It’s called Panasonic VXX[numbers…]. All of them are more or less the same, with the almost the same spectral signature. Community users have also uploaded 3nm sampes for P3 Mac. They are located in DisplayCAL colorimeter correction database. Plot them ( SPD value vs nanometer wavelength) and you’ll see. Hi Nasim, this looks like a really good and thorough tutorial. However, I’ve just bought an iMac Pro and when I downloaded the iMac-iMacPro.ccssfile to add this correction to DisplayCAL I got the error message “The selected colorimeter correction is not suitable for the selected instrument.” Any suggestions? I did proceed with the calibration without this correction and now have a display profile for the iMacPro which I’m now using, which is slightly different to the factory iMac profile. In my setup with this iMac Pro I also have an Eizo CG222W connected as a second display. (This Eizo, which is a few years old, was my primary screen with my old Mac Pro 4.1). Today I also calibrated the CG222W using Colour navigator 6. After doing both calibrations the colour on the iMac Pro and the Eizo screen are significantly different. After matching screen brightness of the iMac Pro screen to that of the Eizo what I have is an iMac pro that appears to have a red tint and an Eizo that appears to have a green tint. I was hoping to achieve a pair of closely matched colour calibrated screens. Do you have any suggestions? I’m a photographer and film-maker so I’m keen to get this right. -Report CCSS issue to DisplayCAL. Florian may ask you for log files or some other information to reproduce the issue. Hi Nasim, Thanks for your swift response. I’ll report the issue and try the whitepoint editor. i enjoyed reading your article on color monitor calibration for imac, my question to you is that i have a i mac 27 inch late 2012 running Mohave 10.14.1. Hello, not sure if anyone is still replying to this thread but I have a question if you are. I have a mid 2017 27″ iMac and I’m using an Xrite Colormunki Display for calibration. First off should I delete the Xrite software from the computer. Will the i1pro correction file download that you have provided in this article work for the Colormunki Display as well. I have tried your profile plus one on the DisplayCal website where they had a profile for the 2017 27″ iMac and colormunki display (which I’m guessing was a user defined profile that was uploaded to the site). There seems to be a slight difference between the look of the 2 different profiles. I also seen that it is possible to use Xrite’s correction profiles for that device that came with the software but I’m not sure where to find it. Any help would be appreciated. -xrite bundled in latest i1Profiler a correction for near full P3 displays. It’s called Panasonic VX, you can read comments above yours. Hello Consultant, and thank you so very much for the reply. So it sounds like the profile that was made for download is a ccss profile and will work with ColorMunki Display? I am a newbie to Mac as well as calibration. I see an actual calibrator that goes on the front screen which has not been mentioned. Is that something separate from this tutorial? Or do I purchase that to use with this process? Sandra, of course, you need an actual device to do calibration. You cannot calibrate your screen without it – any software calibration is going to be very inaccurate and it might make things drastically worse than they already are. Please see the Colorimeter section of this article. I see that you set the white point at 120 and do not check the option to measure ambient light. Can you tell me why this is so? I tried the first time to check the option and measure ambient and the calibration was a disaster upon verification and I went back and did it without and it came out fine. Can you set me straight on this feature and whether I should be using it and if so, how to properly do it? I have new iMac-Pro and using XRite iDisplay, I downloaded DisplayCal 3.7.1.4 and ARG 2.0.1 and the GUI seems to have some different settings and menus than the ones in your article. Any chance for some updated screen grabs? Also, I find 120cd/m to be quite dim, (even compared to EIZO CG for press proofing). Any reason I shouldn’t calibrate my iMac Pro to 200cd/m which appears a better match? Set the brightness level that is suitable for your ambient light. 120 is just a common value for a dim room. If you need more, use it. For example ISO conditions for practical appraisal (P2) is D50 white and 160cd/m2, under typical ambient light conditions described by this norm. Also keep in mind that due to the lack of functionality of iMac or laptop screens white point is corrected at GPU level droping resulting brightness. If you start with a typical cold bluish white ~7000K or higher and you whish to use “5800K daylight” as calibrated white overall brightness after calibration will drop, contrast will drop (not usually a problem for softproof purposes) and available unique grey levels will drop (but since newer iMac have AMD Radeon GPUs high bitdepth LUTs and dithering should mitigate the impact of this issue). Anyway… imacs or macbooks or other laptops (unless they have some kind of HW cal) are not very suitable for this task due to these limitations and glossy screens. Make a guess about how much will drop (under 10% for D65 white maybe, more for softproof warm whites). Then set YOUR desired white level + drop estimation as starting brightness. 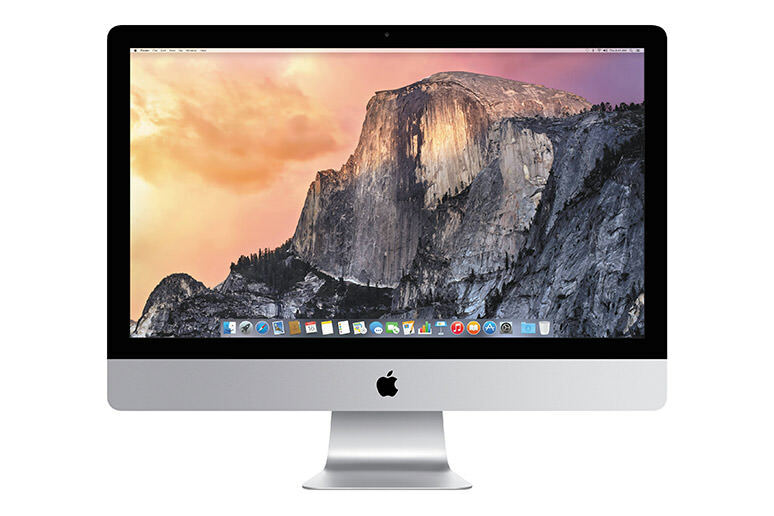 You can try to tweak iMac brightness level after calibration untill it matches your Eizo. Then run a profile verification on iMac in order to test if white point did not drift because that change. It should nit vary too much, but since you can measure there is no excuse. When I follow the instructions above I get a much more limited number of options available to me in the “Display & Instrument” and “Calibration” tabs than are visible in your screenshots above. I have a 27 inch iMac Retina Display (late 2014) and an x-rite Colormunki Display. Do you know of a reason why my options are limited? OK, so this is becoming a serious issue as we have upgraded many computers in our shop to iMacPro’s with EIZO CG277’s next to them as reference monitors. I need to know a way to let the EIZO calibrate itself using its built-in colorimeter and Color Navigator software, and then use the i1-DisplayPro to “fingerprint” the EIZO and use it as a target to profile the iMacs. The iMacs when calibrated using the system this article describes are much better than uncalibrated, for sure, but are still way off the mark from the reference standard EIZO’s (they seem to be too bright, too contrasty and too warm. We have tried turning down their brightness significantly and that helps, but still wondering there must be a way to take a reading off “Monitor-A” then build a profile for “Monitor-B” to match it closer? Is there not? Any help here will be greatly appreciated! Thank you! Hi, thanks so much for the instructions, I think I did it right! My report results are below – are they OK or is there anything further I need to do?